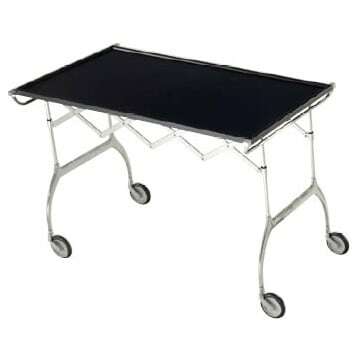 Besides being a practical trolley with a striking combination of plastic and metal components, Battista is an all-out extendible and folding table, ideal for buffets and aperitifs or as a small single table. It is available in most colours: white, black, blue, plum or cream and in the elegant polyester version of bright lacquered white. Do you have a question about "Battista"? How can we contact you?